Have you suffered from a pulled neck muscle in an accident that wasn’t your fault? Maybe you suffered a pulled neck muscle which caused a painful sprain, or you suffered a pulled neck muscle in a whiplash accident? 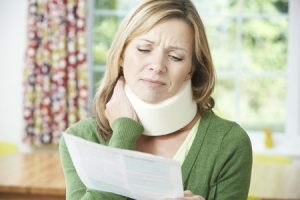 Whether you suffered your pulled neck muscle in a road traffic accident, sports accident, a slip, trip or fall accident or in any other situation, as long as you have proof that it was due to the negligence of another party, you could be entitled to claim thousands of pounds in compensation. Trust Legal Expert, to help you claim the personal injury compensation that you are due for your pulled neck muscle injury. We work with solicitors who have up to thirty years of experience helping victims of pulled neck muscles, whiplash and sprains get the compensation that they are entitled to. Call us today to speak to one of our friendly advisors. They will let you know what your whiplash or pulled neck muscle claim could be worth and can match you with an expert solicitor, at no extra cost to you. In this case study, we are going to look at the case of Miss M, who was involved in a road traffic accident in 2014 when she was 22 years old. The accident occurred when Miss M was driving through a traffic light controlled junction, on a green light traffic signal. At the same time, a police officer on duty was driving an unmarked police vehicle. Proceeding from a nearby road he exited on a nearby traffic light and collided with Miss M’s car. Unfortunately pulled neck muscle whiplash injuries are relatively common in the UK. Whiplash occurs when then the head is jerked backward or forwards violently, the soft tissues of the neck become overstretched and damaged, causing a muscle sprain. According to a recent report, there are 2.7 million whiplash claims each year in the UK, costing the insurance industry £2bn in damages. This is twice the average of the number of whiplash claims for Spain, France, and the Netherlands. What Pulled Neck Muscle Injuries were Sustained in this Case? As a result of this road traffic accident, Miss M suffered soft tissue injuries to her neck, back, shoulders which she found painful and bruising to her legs. As a result, she had to undergo physiotherapy and miss a week off her work. What’s more, the traumatic nature of the car accident caused Miss M to develop travel anxiety, a phobia of travel which made her want to avoid travelling. Miss M’s bruising took 5 weeks to heal. The assessments from her doctors concluded that her pulled neck muscle whiplash injuries should take 13-15 months to heal. The psychological damage Miss M endured was expected to take 15-17 for her to come to terms with. Miss M proceeded to involve a personal injury lawyer, to sue for pulled neck muscle whiplash compensation from the Defendant, the Police Department that the police officer was an agent of. The Defendant’s insurance company put forward an acceptance of 60/40 liability, in favour of the Defendant – using the Griffin v Mersey Regional Ambulance (1997) case to justify their claim. Miss M’s legal team rejected the offer, arguing that because it was an unmarked police vehicle, and witnesses could not agree whether or not the police car was displaying the required lights and signals as it entered the junction, the Griffin v Mersey Regional Ambulance (1997) case was not valid. Eventually, the Defendant’s legal team accepted a counter offer of 75/25 liability in the Claimant’s favour, which was put forward by Miss M’s legal team. This is a good example of why you should always hire a personal injury solicitor to help you make an accident claim, as they can negotiate for you to be paid compensation on the terms you are legally entitled to if the Defendant’s insurer intentionally offers you an offer that is too low. The pulled neck muscle whiplash claim was settled out of court. The Defendant agrees to pay Miss M £6,215.15 in general damages for “pain, suffering, and loss of amenity” and over £600 in special damages, which included payment for medical expenses, miscellaneous expenses and other damages caused by the accident. If you have experienced a whiplash pulled neck muscle, painful pulled neck muscle, neck sprain or similar injury, you may want to use a no win no fee solicitor to help you pursue your accident claim. This means that the solicitor will offer a no win no fee service, so you will only pay your fees if you win your case, meaning you won’t have the stress of having to put up funds in advance and there will be no financial risk to you. To find the best no win no fee solicitor to represent your case, speak to Legal Expert today to inquire about no win no fee. Whether you suffered a painful pulled neck muscle in road traffic accident, sporting accident, you fell in a public establishment like a shop . or restaurant or any other scenario, be sure to claim the compensation that you are entitled to. If another party was at liability for your accident you could be owed thousands of pounds in compensation. We are Legal Expert, a trusted legal advisory service who match victims of pulled neck muscles, whiplash, sprained neck muscles and soft tissue damage to some of the country’s best personal injury solicitors. Call us today on 0800 073 8804 to see if you have a valid claim and how much compensation you can claim. We’re looking forward to hearing from you. A pulled neck muscle NHS Guide, which explains neck pain. Help and advice for Claimants who have suffered from whiplash, including advice for making a whiplash accident claim. Help and advice for Claimants who have suffered an injury that was not their fault in a car accident. This includes advice for making a car accident claim.